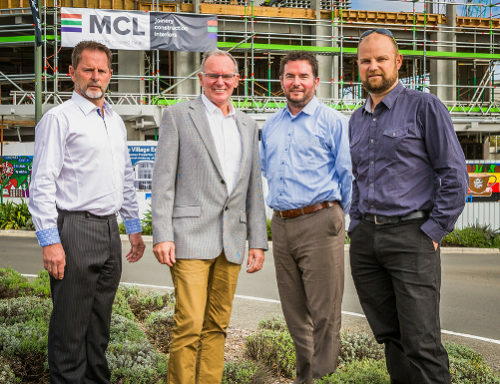 The name Mackersey has been part of the Hawke’s Bay construction scene for nearly 70 years. For the general public, we’re used to seeing the Mackersey Construction ‘under construction’ signs on many commercial, residential and infrastructure developments throughout Hawke’s Bay. What many of us don’t know is that within the industry and the wide range of sub contractors and other associated businesses, they call the business “MCL”. Now, 68 years after JC (John Charles) Mackersey Ltd was formed, the company name will be the same as what the tradies say. From April 1, the company’s offices and facilities, as well as many of the current building projects will have the new branding MCL Construction Ltd.
MCL managing director John Bower says the new name completes a new direction for the business, with John and David Mackersey being joined in 2015 by project manager/ estimator Phillip Mitchell and financial accountant Michael Bush as MCL Construction Ltd shareholders. Also under the MCL banner will be MCL Interiors, specialising in suspended ceilings, office partitions and passive fire and MCL Joinery Ltd, a high end commercial and residential joinery business. MCL Joinery is headed by Ross Morgan, who has run the joinery division for 20 years while Jon Cruise is in charge of MCL Interiors. David Mackersey says the three MCL entities are all in safe hands with an ownership structure that’s focussed on the future. “Succession planning is important and we are particularly pleased that we have a good mix of experienced staff stepping up, as well as some younger talent keen to come through,” David said. For John Bower, one of many long standing members of the team, new branding provides the perfect platform to showcase the many projects – past and present MCL has undertaken, as well as telling the story of the positive impact the business has had since JC Mackersey first started in 1948. As he looks to the photos on the walls at the Kaiapo Road headquarters, which has been home to MCL from the very start, he highlights the long and successful careers that have been established. John Caccioppoli has been with the company for 53 years, Mark Adams for 40 years with Peter Biggs, Dave Mischefski, Gavin Mackay, Dave Bower and Ross Morgan serving over 20 years. John has also been with the company for 27 years, becoming a shareholder in 2006 and managing director in 2013. John says MCL is particularly proud of the many tradesmen that have undertaken apprenticeships over the years. “There’s been hundreds that have worked at MCL, many of whom are still with us today. We take great pride in having long serving loyal staff. From the outset the Mackersey name has been attached to many prominent buildings, and established itself as the preferred construction firm to many major projects. Both David and his late father, should be incredibly proud of the achievements of the business during their eras at the helm but also over the last decade. Just take a walk around the Hastings CBD and look up to the high rise buildings like the Westpac Bank, ANZ Bank, the Tower Building (next to the Hastings Police station) and the Hastings District Council civic buildings. Other notable buildings include the Takapau Freezing Works and Mangaroa Prison. During David’s tenure as managing director major projects included the Farmlands building, Karamu Holden, the Lowe Corporation grandstand at McLean Park and the Hawke’s Bay hospital. In 2003 David started to slowly move away from his day-to-day role to establish Mackersey Development Ltd, a property development and management company based in Havelock North. “David’s drive behind Mackersey Construction was to support the development of the local primary industry, both in agriculture and horticulture. “We have continued to evolve and diversify to provide a first class service to the modern era with construction of government department projects, education, tourism and medical health and aged care facilities,” John said. Recent projects completed include the New Zealand Gold Architecture Award winning Iona College’s Performing Arts Centre and Information Resource Centre, the KiwiBank customer service centre in Hastings, Business HQ and the new Club Hastings (a merger of the Hastings RSA, Hibernian Club and Heretaunga Club). John says the Hawke’s Bay construction scene is “very buoyant” with projects on stream for at least the next 12-18 months. “There’s also plenty of projects yet to be awarded. “Presently we’ve got large scale projects such as the Tamatea Pak ‘n Save and the Village Exchange & Porters Hotel complex in Havelock North. “There seems to be no letting up at the moment, which is fantastic for the local economy and the community by way of jobs. “MCL alone employs over 110 staff from labourers, apprentices, carpenters, site managers and administration staff. “We’re also committed the supporting the community and over the years we’ve supported many organisations and charities such as The Lowe Corporation Rescue Helicopter, Havelock North junior rugby, the Waimarama Surf Club and the Staples Rodway Cape Challenge. “We see the new brand as an opportunity to bring our brand to life and showcase ‘construction inspired by life’. “It’s what we’ve been doing for 68 years and we look forward to doing for many more years to come,” John says.